BOSTON COLORS. A bit of background~Bostons are known as basically black and white dogs with a characteristic marking. But few people are aware that there are other, very attractive colors. They are hard to find, but delightful to discover... sort of like finding a four leaf clover! These colors are shown in the pictures on this site. Reds and chocolates have reddish or brownish noses and gold or brown eyes, they have no black pigment anywhere. Fawns and golds, are a distinct gene from reds and do not mingle genetically. They have black noses and eyes. They can come with or without black eye circles or liner, black mask, and a shaded black trace down the back. Blue is just like the blue found in many breeds. A dilution of black, it does not have any black pigment anywhere. The nose is blue-grey like the coat, the eyes are dark to varying degree. Piebald or spotted is a pattern not a color, consisting of white body with colored spots. Any of these colors can come with brindling. These colors were common in the breed years ago and accepted in the AKC breed standard. But standards (breed "blueprints") tend to be revised over time due to various influences, some worthy, some not (in my opinion). The Boston standard was eventually changed to exclude all colors but the basic three(see below). Following that change, breeders eliminated the excluded colors from the breeding pool, so there were gradually fewer of them. They eventually became more-and-more "rare", and might have disappeared completely. Recently, reds, chocolates, blues and fawns, an occasional white, as well as spotted Bostons, are being revived by a few color enthusiasts. This is much to the consternation and outrage of show breeders who believe that no dog should be bred that doesnt conform to the AKC standard and isnt being bred for "show". HEALTH and GENES~ Diet plays a significant role in every aspect of health. There are credible theories about the cause and effect of diet, vaccines, and toxins on most of the defects listed below. I am not going into that. I'm sure this is too lengthy already! There are undesirable genes in all breeds. Every single dog has undesirable "bad" genes, even the so-called "designer breeds" (mixed breeds) that lay claim to greater health*. These bad genes dont usually show, they're hidden. Any breeder who values healthy dogs does their best to avoid them. But even the most careful, cannot clear out all these traits from their breeding. Eventually they do turn up. This does not reflect badly on the breeder, in, and of itself (contrary to what you may believe). It's what a breeder does with that information that is so important. The following are the most common defects that can turn up in any color or marking of this breed, and in anyone's breeding program. There are tests for a few of the inherited conditions. Some people test, which does reduce the likelihood of producing those defects. The cost of a pup from tested parents will usually be higher to cover the significant cost of testing. Not everyone can afford testing, nor are tests available in all areas. There is a range of how serious each condition is. Some are minor and do not require any treatment, others are major, even life-threatening. SHORT NOSES~ Bostons are in a group of short nosed dogs called Brachycephalics. By nature, this short nose, part of the breeds great appeal, can be considered a "defect" in itself. Any deviations from the wolf origin, such as short legs or wrinkled skin, are human creations and are therefore not "natural". There are health consequences in all our creations. Few could ever survive in nature. When you choose a lovable short-nosed breed, there are certain problems that come as a package deal. Breathing impairment due to the shortened airways can cause dogs to be unable to tolerate heat. They are also at greater risk when given anesthetics, and when sick with any respiratory illness such as kennel cough or bronchitis. 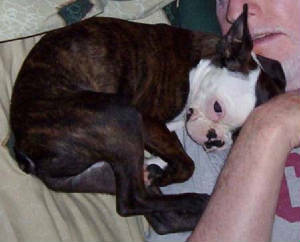 Bostons may have "elongated soft palates," this is often the main cause of restricted airflow. Another cause of restricted airflow is pinched nostrils (stenotic nares), both of these problems may, or may not, cause apparent difficulty. There is effective surgery to fix both if needed. The breed also can have the following, which are usually, but not always, hereditary: heart defects, deafness (can be mild, only one ear, or total), cataracts, "hereditary" mange (known also as red mange, immune mange or demodex), slipping knee caps (patellas), deformed vertebrae (hemivertebrae, always hereditary), hernias, allergies, epilepsy, low thyroid, and cherry eye. Some of these are rarely detected because they cause no problems. This may seem a long list, but many breeds have much longer ones. Bostons are actually a very healthy, sturdy breed. DEFECTS and COLORS~There is no evidence that I know of, showing standard colors to have fewer problems than the non-standard ones. There are two exceptions. Albinos have a higher incidence of problems than non-albinos in any breed. Albino Bostons have pink noses and are quite rare. They should not be confused with equally rare, white Bostons (splash with almost no color spots) which usually have black nose and eyes. Deafness seems to be more common in white-eared dogs. It is known that if the hairs in the ear (which help a dog hear), are without pigment, there is a bit more chance the dog may be deaf. I cannot say how common this is, but any color can have deafness. THE AKC STANDARD currently allows only three colors, black, brindle (a pattern of striping) and seal (the off-black look of an actual seal, with a reddish cast), all with white markings on legs, neck collar and a blaze between the eyes. Other colors and markings aren't permitted. It is the hope of some of us who love the "off color" Bostons, that some day the standard will be revised to allow these colors to be shown. For those who are interested in showing, there are a couple kennel clubs allowing Colored Bostons to compete for Championships. For people wanting companionship only, a show dog is no better a pet than a non-show dog.